The other day when I arrived at Joey’s house he seemed taller and older to me. As I sat down to work he grinned and through his eyes to his wall calendar, where there was a picture of balloons over yesterday’s date. Oh! It had been his birthday. Perhaps he looked taller and older because he was fully feeling the weight of being five. A big kid with big ideas, plans, and thoughts. How is Joey already five? It seems crazy that this year has gone by so quickly. I love using Joey’s birthdays to remind me of what typical development looks like at this age. Sometimes when we work with kids like Joey we can get so caught up in what makes them different from others that we forget to see what makes them the same. So where does Joey fit into this long list of five year old characteristics? 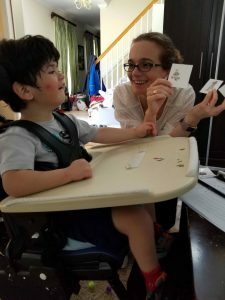 Literal Thinking: With my own almost five year old I can see the literal nature of her thinking patterns come through in her daily communication, but it is far harder for Joey to show us that through his gestures, vocalizations, and AAC device. It’s important to remember that he probably is taking what we are saying literally, and that we need to monitor our words and catch ourselves in those moments so we can explain to him what we mean since he can’t ask us like most five year olds can. Five year olds like to help. In my own house my almost five year old comes running when she thinks there is a chance she help (even when it isn’t very helpful). For Joey, we can remember to slow down and find opportunities where he can help us. He can help me take the tops off my bins, open books, or hold items while I get something out. These may seem like some options, but hopefully they will build his sense of agency and identity and confirm that he is a valuable member of our world. Expressing thoughts through actions: It’s also good to keep in mind that most five year olds express their thoughts through actions. Joey is limited in the actions he can show us – he isn’t easily able to play in a housekeeping center. 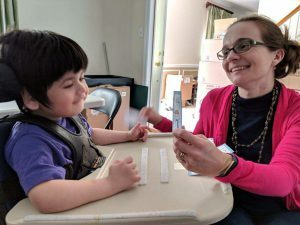 It is important for us to give him times for dramatic play and gross motor games (like hide and seek) that are adapted to meet his physical limitations, but give him the same cognitive explorations that a typical five year old would participate in. Part of this is slowing down, following his lead, and watching him for clues to what he’s thinking and pretending in his head. I also love the reminder of the importance of repetition and structured activities. 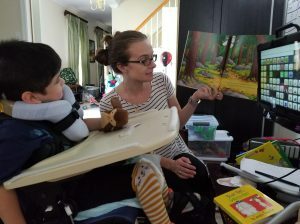 Joey does love repeating the same games and activities while we read books, and once give a structure of an activity he follows it well. I’m looking forward to watching Joey’s development this year as he takes on more of these five year old characteristics. On October fourth MaryAnn Shaw (one of Joey’s grandmothers and a special education professor) and I had the opportunity of presenting our research on Joey at the Pennsylvania Council for Exceptional Children’s conference. Other than this blog this was my first opportunity to share Joey with the world. It was an intimidating task. Although we are tracking Joey’s progress as a single case study, Joey feels like so much more than that. Single case study sounds impersonal and scientific, and Joey is anything but that. He’s an active, engaging four year old. Attempts at remaining scientific are hard because the true nature of working with kids is messy. Things happen. Equipment breaks. Distractions happen. Jokes turn into side tracked lessons. In the end we decided not to attempt to stay clinical and research-y. Instead we opened the presentation by just sharing Joey – his personality, his loves, dislikes, his medical diagnosis, and his history. He’s a person, and that person is an important part of the story. As I talk about him I want people to love him like I do, but more importantly, I want them to see glimmers of Joey in the kids they work with. I truly believe the biggest aspect of Joey’s success are the team of people in his life who are presuming competence in his cognitive ability. It would be easy to assume that he had greater restrictions than just motor planning. Yet Joey’s team stops and waits, searches for those glimmers, and follows Joey’s lead and intentions, and makes room for the funny (sometimes sassy) and sweet boy to shine through. As I discussed the pitfalls and successes we’ve had with Joey’s communication device, and reviewed Joey’s data, I realized I wanted the pre-service teachers in the audience to take away one idea. Never stop believing in a child’s ability. If something isn’t working, change your tactics. If what you’ve always been taught to do isn’t working, try something different. Shift your focus. Re-assess your goals. Re-examine the data and look again at the child in front of you and not the standard methods that traditionally work. Those methods are essential places to start when we’re working with our kids, but when they don’t work, we can’t assume that the problem is the child and not with the instruction. We have to get creative, reach beyond ourselves, and learn something new. You never know when a child may surprise you. When I arrived at Joey’s house on Friday afternoon he was in a great mood. 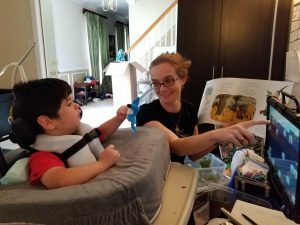 He was giggling and excited to read, and his personality shone throughout our whole session. We were reading The Gruffalo, which is about a mouse and an imaginary yet real scary monster. As we read about the scary Gruffalo with his terrible teeth in his terrible jaws, I tried to use it as an opportunity to model using body part words like teeth, tongue, knee, leg, back, etc. I am not sure if he meant to or not, but every time I asked Joey something where the answer should have been teeth, he selected the word tongue. The words are next to each other, and at first I thought it was an accident, and that he was having trouble selecting the correct word. I’d select teeth for him, and he’d quickly click tongue after I’d hit teeth. Hmmm…. “Are you playing with me?” I asked, and he began to giggle. “Love tongue” he responded. Later in our session he giggled at everything that silly turkey did in Red Hat, Blue Hat, and giggled whenever we used his device to say “Uh oh” when the turkey was dressed wrong. As we neared the end of our session Joey went into the words and hovered over the word fall. He didn’t select it though, so the screen remained on. Then he picked up the stuffed owl he’d been playing with, held it up high, verbally said “up!” and the dropped his owl. After it fell he turned back to his device. “Fall” he said proudly. Yup. He labeled exactly what happened – owl went up, and then it fell. 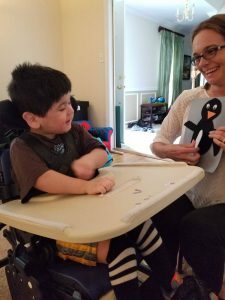 Although the moment made me smile because Joey was so intentional about dropping his owl and labeling it, the falling owl also reminded me about how difficult it must be to communicate on the AAC device. How often do I review words I’m going to say silently in my head, ahead of time? How often do I plan out my speech? Joey may be able to do that internally, but that doesn’t help him pull the words up onto his screen any faster. And when he does know a word he wants to use he may get frustrated or have trouble finding it before the incident and selecting his word. How often do I assume Joey randomly selected a word, or that he hit the wrong word, when really Joey was simply trying to label something that happened many moments before. The “fall” incident reminded me to continue to presume competence when I’m working with Joey, and to continue to give him significant wait time when supporting his work on his device. It also served to show me just how much Joey is planning his communication ahead of time. This forethought, while small, represents the beginning of important executive functioning skills Joey will rely on the rest of his life.